The U.S. stock market is the greatest wealth-creation tool in history. It allows you to become a partial owner of thousands of profitable businesses. When paired with the power of compounding, the market is what allows us to even consider saving for retirement. Even so, people mostly complain about the market's bad days and investments that fail to rise immediately. The stock market took a wild ride recently. On February 5, the Dow lost nearly 1,200 points, about 4.6%. And Wall Street's "fear gauge" – the CBOE Volatility Index (or "VIX") – soared by more than 100%. 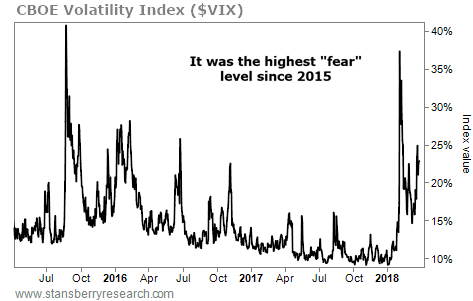 The VIX is often known as the "Fear Index" because it doesn't measure the actual volatility of the stock market. Instead, it measures the volatility that investors expect in the future by looking at how expensive options – which investors can use as protection – have gotten. Looking at days like these, you may conclude the market is scared. You might look at the balance in your retirement account and wonder if it could be 20% or 30% lower in a few months. But if you look at valuations – what people are paying to own stocks – it's clear the market isn't that scared. Since the end of January, the price-to-earnings (P/E) ratio of stocks fell from 22.7 times to 21.2. Keep in mind that the S&P 500 Index has traded at an average ratio of around 16 over the past 60 years. And as Steve Sjuggerud pointed out last week, even the S&P 500's forward P/E ratio (which takes into account next year's estimated earnings) is just around its 25-year average... Not high, not low. This may sound like splitting hairs, but the difference between scared and slightly less optimistic is a big one. And understanding that difference will help you sleep well at night. We don't know where the market will be next month. It may be down or up. The recent correction could develop into a bear market – though we don't suspect it will. The point is, if you're preparing for or near retirement, you've got a heck of a lot to look forward to. And if you set yourself up with a sound financial plan, you have little reason to be concerned. First, focus on saving and investing. You need to live below your means to accumulate wealth. There's no backdoor trick around that fact. Then, when you try to figure out your investments, set reasonable expectations. You're not going to double your retirement account in a year. You are going to have wins and losses... and, over time, you'll see the beautiful effect of compounding. Building an intelligent portfolio of stocks, bonds, and other asset classes also means you'll have less to worry about and more to gain. This is the power of asset allocation. Stocks, bonds, real estate, gold, and other investments move in different directions and are influenced by different economic factors. By holding multiple asset classes, you reduce your risk and increase the return you get per "unit" of risk you take on. When you look back, you'll always wish you had more of what went up and less of what went down... But you'll never be able to do that with certainty. Asset allocation doesn't guarantee returns, but it gets you closer and closer to a predictable rate of return. When you make individual investments, you also need to mind your position sizes and use trailing stops. Always limit an individual stock position to no more than 4% or 5% of your portfolio. Yes, when you buy a stock that shoots up, you'll wish you had bought more. But if you get that feeling sometimes, it means you are doing things right. Likewise, a trailing stop will make it so that you know exactly what you can lose from an investment. These are the cornerstones of preventing worry. The simple fact is that "capital" earns a positive return over time. Having a sound financial plan allows you to earn the fair return on your capital... while smoothing out the scary times in the market. "Keeping your wealth stored in a good, diversified mix of assets is the key to avoiding catastrophic losses," Dave writes. Learn how to do this in a few simple steps right here: How to Make Your Most Important Wealth Decision in Minutes.